Welcome! 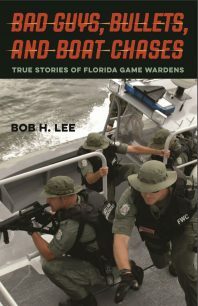 Check out what others are saying about the author’s newest release, Bad Guys, Bullets, and Boat Chases: True Stories of Florida Game Wardens. Then click around the pages to see what you find of interest. Thank you for visiting. Click on photo to order in hardback or eBook. Click on photo to order in hardback, paper, eBook, or audible. Kickoff celebration for Backcountry Lawman’s selection as the 2014 Community Read for Putnam County. Author will Skype with book club members. Thursday, February 15, 2018 | 7:00-8:00 p.m.
Saturday, March 10, 2018 | 1:00-2:00 p.m.
Saturday, March 24, 2018 | 2:00-3:00 p.m.
As part of the author’s book talk, he will interview retired wildlife supervisor, Gray Leonhard. He is the key character in ‘Flight 401,’ the first chapter of Bad Guys, Bullets, and Boat Chases. On December 29, 1972, Leonhard was a two-month rookie, on solo night patrol, when he witnessed Flight 401 crash into the Everglades. At the time, it was the first jumbo jet to crash and the worst aviation disaster in U.S. history. Author will give a 20 minute book talk. Author will give 20 minute book talk. Author will talk to advanced 9th Grade English/writing classes. Author will participate in a multi-author event. Both of his books will be available for sale and signing. 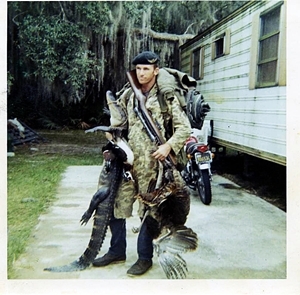 Notorious poacher, click photo to learn more. Author will be selling/signing copies of Bad Guys, Bullets, and Boat Chases. Book talk followed by sale/signing. Bob Lee will give a book talk on his newest release, Bad Guys, Bullets, and Boat Chases, followed a sale/signing. 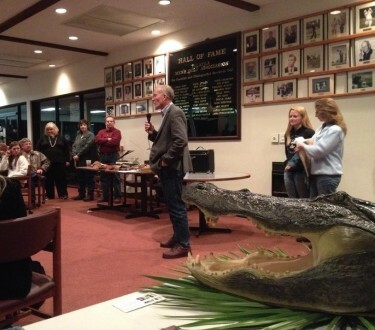 As part of the author’s book talk, he will interview retired wildlife supervisor, Gray Leonhard, who is a key character in the book’s first chapter: “Flight 401.” On December 29, 1972, Leonhard was a two-month rookie, on solo night patrol, when he witnessed Flight 401 crash into the Everglades. At the time, it was the first wide-body jet to crash and the worst aviation disaster in U.S. history. Author will be in studio and co-host a three hour fund drive block. Multiple authors will speak between 9:00 AM & 4:00 PM. Bob Lee will speak at 1:00 PM. His books will be available for sale and signing afterwards. Bob Lee, along with other local authors, will sell and sign books. Date and time of author’s participation to be announced. Local authors will have static displays where their books will be available for sale and signings. A fifteen minute book talk will be given each hour. Bob Lee’s presentation time will post closer to the event. Four Days in Melrose, author will have his books (hardback and paper) for sale at the Melrose Senior Community Center, 307 State Road 26, Melrose, FL 32666. Book talk followed by a sale/signing. Meet the author and Roger Gunter–a legendary outlaw and colorful character from Backcountry Lawman. They’ll give a tag-team talk followed by a book sale/signing. The kickoff for the author’s speaking tour of all the branch libraries within Marion County. He’ll give a book talk followed by a sale/signing. Book talk followed by sale/signing–open to the public. Tune in to the Hank Conner radio show at WUFT-FM 89.1. 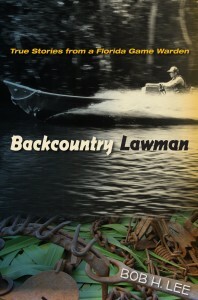 The author will talk about his book, the video, and his experiences as a 30-year veteran Florida game warden. Thirty minute book talk followed by 15 minutes on tips for nonfiction writers. Book sale/signing afterwards. ‘Meet and Greet for Authors’–various authors from south Putnam County will have their books for sale.